We travel far and wide to find the most unusual pies to review. A recent trip took me to the end of the world, or at least a garden centre called World's End. I know this garden centre near Wendover, Buckinghamshire very well. It used to be a normal place but it has since ballooned into more of a vaguely-gardening related mega centre. There used to be one small cafe/restaurant but now it has a huge cafeteria style restaurant and a Costa coffee which are both somehow still busy. Where did all the new customers come from?! Anyway this is possibly a measure that I feel I am starting to get old, I can't deal with things changing. One good change however is that they now have let some space to deli company 'Loaf & Larder'. It isn't really my kind of place, it looks a bit like a farm shop but nothing is local so what's the point? However, what I did like was the massive range of pies. The primary supplier is Real Pie Company. We have previously really enjoyed their pies so much so that they currently occupy number 8 spot in our all time rankings! It was a great opportunity to indulge in some of these top ranked pies but something else caught my eye. A small pile of Scotch pies, looking somewhat out of place next to the bigger, premium pie which were adorned in flaky pastry. This isn't really the kind of place I expected to find a Scotch pies because they are not normally sold as premium products, even the best ones seem to be quite cheap. Perhaps because Scotch pies are less common in the South of England this is classed as an 'exotic' pie?! When I asked who made the pie I was surprised when they said it was made by South England Pastries I was expecting a more Northern company. If you regularly read Pierate you might realise I have a bit of a facination with Scotch Pies and I am always on the look out for pies to add to our list of the best Scotch pies. Thus, I couldn't resist taking the plunge with this one. However, I should have more carefully checked the price first. This quite small pie set me back £2.99!!! Yes, some of the other pies cost a lot more, but they had the premium ingredients to justify it. As far as I could tell Scotch pie would not be a lot different to the ones you can get in Morrisons for 69p. It had better be good to justify the price. Fortunately there were some things about this pie which lived up to expectations. It was a classic Scotch pie shape and browned up really well due to a good glaze. The filling was really tasty, and was very moist. 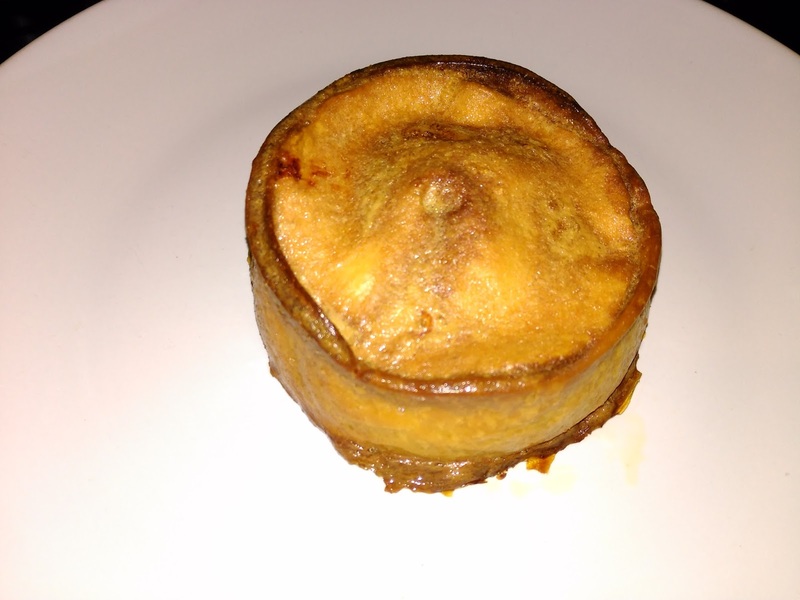 There was a great fat content which oozed through the pie, not everyone's cup of tea but a must for a good Scotch pie. It had a rich beef flavour, complemented well by a bit of a peppery kick. Sadly though the pastry wasn't great which was ironic given that the company name indicates a specialism in pastry. Perhaps I over cooked it but the pastry was too hard and slightly chewy which was a bit odd. It also tasted a little doughy. It wasn't terrible but not good enough at this price. 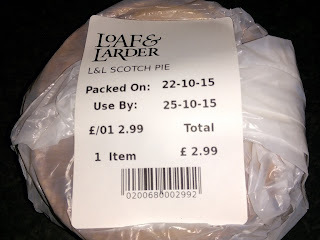 It was nice to see a Scotch pie in England but the price would put me off getting it again even if they are more difficult to find in England. It wasn't consistently good enough to stand out from the supermarket competition and there are better premium options available in England (such as Piebury Corner). I contacted South England Pastries afterwards who confirmed that they make this pie. 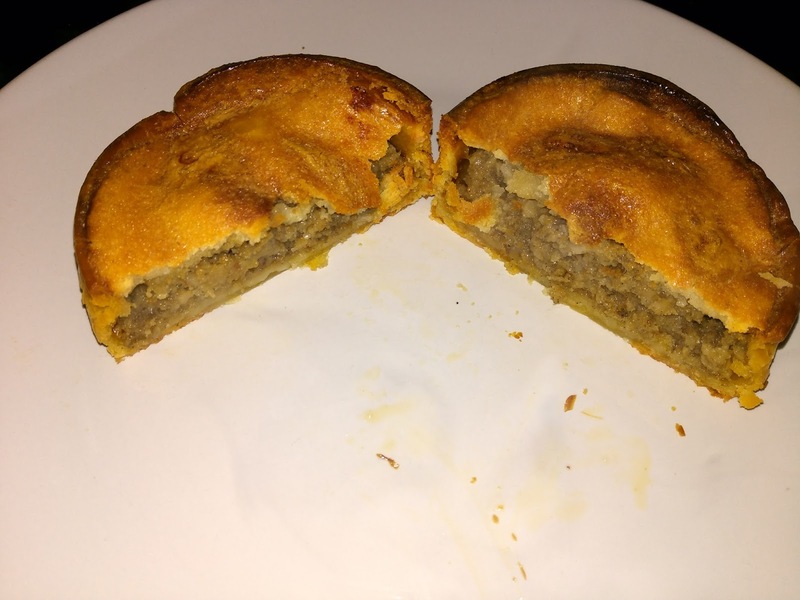 They said "all the pies we make for Loaf and Larder are made in England except for the Scotch Pie which is made at our Scottish site" so perhaps not such an English Scotch pie after all! Still it's easier than the 1000 mile round trip that some do in order to get hold of genuine Scotch pies!